Built around an industry proven, highly secure core. A perfect fit for mobile merchants, the Ingenico iPP350 compliments shoppers and retailers with it"s compact design and speed of use. From the moment the card is swiped, the Ingenico iPP350 ensures the payment is secure all the way to the authorization. By using Ingenico"s proven security measures, data encryption is maximized to prevent fraud and corrupt data. IPP350-11P1914A	 iPP350, Pin Pad, Color Display, PCI 3.X device, Contactless, EMV, NFC enabled. Power supply and cables sold separately. Requires key injection in order to accept debit or credit card payments. Please call for more information. 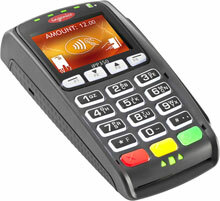 The Ingenico IPP350-11P1914A is also known as ING-IPP350-USSCN04A	or IPP35011P1914A	.